Hoboken could see a court ordered vote of its City Council if a strikingly similar Newark case where a bruising battle over what constitutes a tie in a council back filling appointment comes to bear. According to a Newark Patch story, a judge ordered all eight council members to vote on the open Newark council seat appointment. 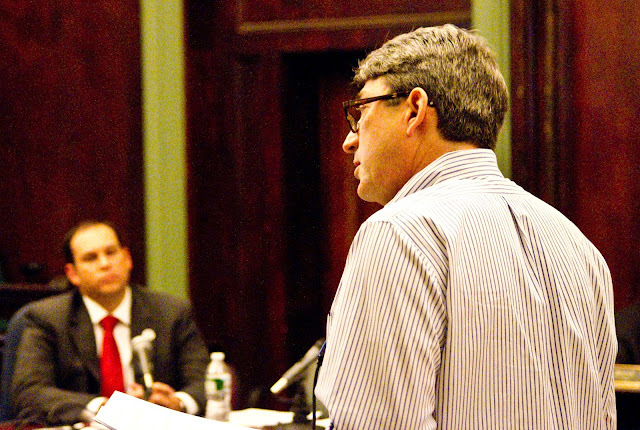 As in Hoboken, a council member had avoided showing up and invalidated a vote by the city's mayor, Cory Booker, leading to the court intervention. Jim Doyle addressed the City Council as a citizen earlier this year. He'll be bach. Councilman-in-waiting Jim Doyle will see his turn when a hearing set for later this month in Hudson Superior Court takes place. Doyle had been appointed when a 4-3 vote was held twice over consecutive meetings in October and the mayor issued an additional vote. The judge in the Hoboken case initially said five votes were required and he anticipated an application from the City calling for a full vote of the City Council. Council members Beth Mason and Michael Russo were absent in each of the meetings for the council vote on the appointment. While Russo claimed through his cousin Terry Castellano a family illness for his convenient absence, Mason has not offered a straight answer but made some limited comment to being out of town. On the day of the meeting she failed to attend, she was witnessed just hours earlier driving with her daughter in town. Ironically, after Doyle was ruled needing five affirmative votes, the council meetings have found their mojo with all eight members in attendance. ... Superior Court Judge Dennis Carey III issued an order saying that in the event of four "yes" votes for Speight, Booker would be allowed to cast a vote. "Courts have held that where a special number of votes is required ... that abstentions, failures to appear and recusals are 'no' votes," said Corporation Counsel Anna Pereira. Wednesday night the council members who attempted to block the successful sale of the hospital voted down payment to the law firm leading the effort. Will that be their last taste of obstructive success in a 4-4 deadlocked vote? Talking Ed Note: Defeat is so close Beth Mason can almost taste it. She'll need to share the chalice with Michael Russo along with Tim Occhipinti and Theresa Castellano, her official co-complainants in the latest Mason funded lawsuit against her council colleagues and the people of Hoboken. Politicos on both side have quietly voiced the inevitability of the Doyle appointment being successfully finalized. An unconfirmed source says the push to turn the Doyle appointment into a sabotaged legal operation came from both Beth Mason and Michael Russo's mother, Michele. Requests to see the lawsuit against Doyle dropped after the severe losses in Hoboken due to the hurricane have fallen on deaf ears and the Hudson Superior Court will have to make the full council fulfill their obligation and vote.